While working cooperatively, a team will toss bean bags to acquire 300 points. Orient the participants to each other and open with a brief discussion about the importance of needing other people in our lives to help meet our goals. Have participants give examples of how they currently help each other. Your group has been challenged to set a score for Bean Bag Beez Toss. After your first round, attempt to beat your own record. Any team thereafter will be attempting to beat your record. You must work together as a team to achieve this task. Good luck! 3. Now read the Activity Challenge Box to the group. bags to acquire 300 points. 4. The team must work together to score 300 points. 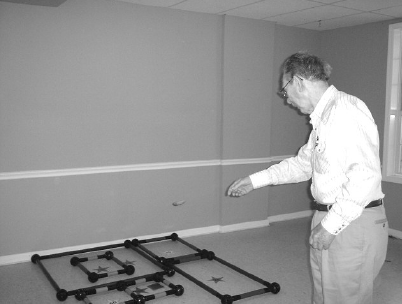 Participants should take turns tossing the bean bags to score points. 5. Groups must add and subtract the numbers as they toss and keep their score. 6. Designating a time limit or limiting the number of tosses increases this activity’s challenge. 1. Play as two teams. Have the teams compete for the highest score. 2. Play outside and use Frisbees instead of bean bags. 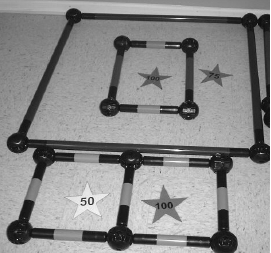 Make the Toobeez shapes larger or make separate shapes. Then spread them out so participants can toss the Frisbees into the spaces. 3. Do not use negative numbers. If subtracting is too challenging, just use positive numbers and add them. 4. When a team sets a record. Take the group’s picture and place it on your bulletin board. 5. Get your staff involved. This is a great activity for interacting with the grand children. 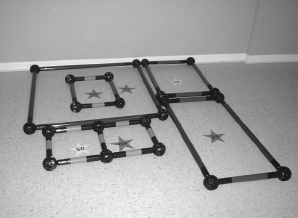 This activity can be done with participants standing or sitting in chairs. If working with patients who are disoriented or confused, do not keep score. How do you feel when you need help from others? How do you feel when someone asks for your help? Is it harder to give or receive help? Was any part of the activity frustrating (such as losing points)? When was the last time you worked toward a common goal? How does it feel to hold the record? How does it feel to not reach your goal?